Just a year after the successful launch of the Maestro (LM10) its bigger brother the Montego (LM11) was introduced by Austin Rover in April 1984 at a press launch staged in the South of France. The Montego used the existing floor-pan of the Maestro but was made wider by 2" in the wheelbase which provided more legroom for the rear seat passengers. About 60% of the panels were the same as the Maestro, but the Montego was strictly a four door saloon and measuring nearly 16" longer than the Maestro was overall a larger car. An extensive boot area offered a generous 18.4 cu ft of space and the rear seat folded down to accommodate long or bulky items such as skis. Steering, brakes and suspension were copied straight from the Maestro, except that the brake discs were ventilated. The 'O' series engine which was originally intended as a new unit for the ageing B series engine that powered the MGB, but only this engine only appeared in a few prototype models. This 2 litre engine destined for the MG Montego Efi had a new alloy cylinder head in which the inlet ports were paired together rather than alternated with the exhaust ports. The drive was through an all new Honda 5 speed gearbox to the front wheels replacing the Volkswagen unit used on the Maestro stablemate. An electronic ignition system, together with Lucas L type electronic fuel injection returned 115 bhp @ 5500 rpm as opposed to 102 bhp on the normally aspirated engine, with top speed matching the bhp at 115 mph. A 0-60 mph time of 8.9 seconds was more than adequate to show "a clean pair of heels" to much of the competition. An innovation on the MG Maestro was the introduction of computer Liquid Crystal Display instrumentation, this was naturally extended to the new MG Montego Efi, having been further developed, but many customers found it to be rather gimmicky and irritating. It is interesting to note that the electronic dashboards, together with their voice synthesised warning announcement system were very short lived, returning quickly to the clearer analogue type instruments. The electronics had for some reason become even more complicated and brash than those previously fitted to the Maestro and many potential buyers of the Montego were pleased to find that conventional analogue instruments were again to be available at the latter end of 1984. As a top of the range car there were special features only to be found on the MG Montego, which included a deeper front spoiler, along with a boot mounted one. Special cast alloy Dunlop TD type wheels were employed which enabled special low profile tyres to be fitted. In the event of a puncture or blow out at speed, the tyre would safely stay on the rim, allowing the car to be brought to a halt with no loss of control. Following on from its MG forerunners, the interior had a distinctive red bias with trim, carpeting, seat belts and piping all colour keyed. There was also central locking and electrically operated front windows together with a quality four speaker stereo radio and cassette system all fitted as standard. These refinements all combined to make the MG Montego a very comfortable high speed upmarket sports saloon, initially priced at over £8,000 it was to prove the fastest and most expensive production MG until upstaged by the ultra high performance MG Montego Turbo which was announced in April 1985. 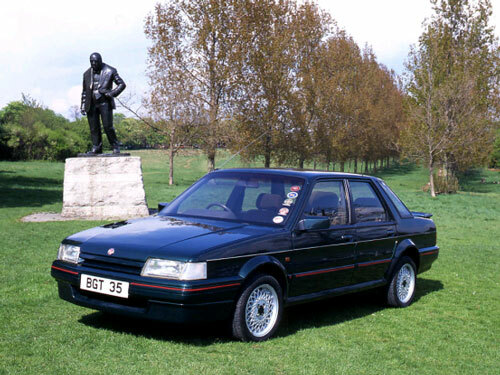 There were only cosmetic changes latterly to the MG Montego Efi similarly carried out on the MG Maestro. This consisted of dropping the Efi designation to be renamed the MG Montego 2.0i and likewise MG Maestro 2.0i. There were changes to the interior design, with slightly revised dashboard switching and the herringbone grey seating cloth was replaced with plain grey. The striking use of red piping and MG motifs continued, but gone was the bright red carpeting to be replaced by a more sober grey. A better quality 4 speaker sound system and a tilt and slide glass sunroof, with built-in sliding shade completed the interior facelift. Exterior wise, the alloy wheels were changed to a cross spoke design, whilst the only other visible changes amounted to colour-keyed door mirrors, discreet 2.0i badging on the rear bootlid and a smaller MG motif repositioned from the front grille to the leading edge of the bonnet. Wheelbase: 8' 5.2" Track: front; 4' 10.5". Rear; 4' 9.8"